Somos+, Kaned Garrido, 24 August 2016 — Among vibrant speeches, spirited debates, coalitions of power, changing sides, unthinkable alliances and the dream of rebuilding the Republic, was born one of the most progressive legal texts. The ambitious statements of the 1940 Constitution are as interesting as the story behind it. The fall of Machado’s dictatorship had left the country with a shaky legitimacy of power. Parties and movements sought profound changes. The revolutionaries wanted to slow the growth of monopolies, the size of the large estates, inequality between classes, poverty in the countryside and cities, and above all: eventually form an independent nation. Within the Constituent Assembly political leaders were battling it out in intense discussions. In the upheaval of World War II Cuban politics took sides in the movements of the great powers. 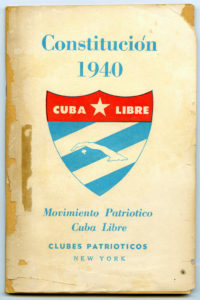 Eduardo Chibas criticized the support of Cuban communists for Moscow’s actions. Meanwhile, laws were proposed to reduce American dominance over the island. Nationalism was the recurring and necessary theme. The constitution has a strong liberal base, a deep respect for the separation of powers and equality before the law. In addition ir proposed an ambitious social program. If we created a commission right now, would would be the minimum estimated salary of a Cuban worker? This was the law that would prevent the employers from passing over the workers. The mere threat of a strike is a reason to negotiate. It is difficult to define the grammatical terms to talk about these laws, to say how much they were held to. The years of that constitution were plagued by corruption and ended with Batista’s coup d’etat on 10 March 1952. Today, a review by officialdom recognizes certain social conquests in the text, but considers it a “bourgeois constitution” and “inferior” to today’s. So we must create our own perception of what is salvageable and what is not. Why is it such an ancient text so important? Can we copy and paste it into the twenty-first century? Many constitutional scholars agree that only some amendments need to be updated, because by its nature it is liberal and fair making it applicable to our time.